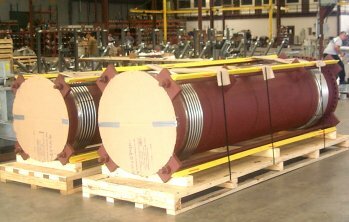 U.S. Bellows, Inc., the expansion joint division of Piping Technology & Products, Inc., fabricated 28-inch and 32-inch O.D Tied universal expansion joints for an oil refinery in China. 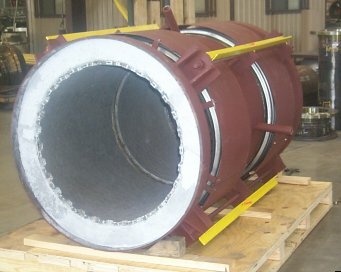 The expansion joints were fabricated from 321 SS bellows, A105, 150#, RFSO. EJMA Standards and B31.3 code were used in the design and fabrication of these joints. U.S. Bellows, Inc., the expansion joint division of Piping Technology & Products, Inc., specially designed and fabricated a 44-inch, O.D Universal, refractory lined expansion joint for a chemical plant in Venezuela.>The expansion joint was designed for 100 psig at 1,000° F and fabricated with 321 SS two-ply tested bellows, A-387 GR11 weld ends, 14 Ga. 304 SS, Hexmesh anchoring system and Resco 17 EMC refractory. The expansion joint was also designed and fabricated per B31.3 and EJMA Standards.